It’s been a while since I gave an update on my state of being. My last entry had me on the fringe of change. I wasn’t sure who I was and embracing this new role was proving very difficult for me. I wouldn’t suggest that me not writing for a while meant all those feelings have gone away, but I’ve been certainly better able to deal with them, thank you God. I’ve been focusing more on prayer and less on my circumstances. It has helped and I know I’m just scratching the surface. I have a tremendously long way to go to understand and harness the full power of a prayerful life. Prayer for me was very superficial, calculated and void of any real emotions. I could say the words but my heart wasn’t in it. I always prayed as if someone other than God was listening. It wrecked the experience for me. It was like I was talking to a distant God with an audience instead of a friend right next me with no one else around. How I see my Saviour has also been challenged this last month. I forget how accessible He really is and how important knowing this is in order to have real relationship with Him. I’m learning, slowly, but I’m learning. As I write this I’m sitting on the bed at the Gettysburg Lodges cabin we have been shacked up in for 8 nights. It’s a place of peace for Cynthia and I.
We’ve been here twice before and fell in love with it very quickly. We decide to stay here for 5 days, but that stretched to 7 and then 9. Tomorrow we are back on the road and heading south. It was a good rest and thank God for this opportunity to unwind, although knowing we are leaving tomorrow does allow some of the stresses of the road to return before we even get packed up. It may seem like I’ve figured out some things but I still don’t know how long this journey will last, or what it looks like, or where we will end up. I still don’t know what I’m supposed to be doing with my time or work. None of things are any clearer to me. What is clearer is that my focus must be on my kids. My relationship with them is directly related to my relationship with Christ and the answers I seek from this journey. I made this connection by seeing how God deals with me and my shortcomings, and the grace He has for me everyday. This must be passed onto my children. The more I do this the more I will understand my own relationship with my heavenly father. I know this is his will for me right now, this focus on my family. I believe a lot will be revealed through this, I just have to actually do it. If I don’t put my focus here I will only be overwhelmed by this sense that I’m supposed to be doing something great in the world and failing at that. Being a father is great enough for now. I went for a bit of a hike up mount Washington a couple weeks back, something I’m still recovering from because I’m old, but on that hike I spent the whole day alone in my head on the mountain. It wasn’t an easy climb for me but I was able to take away some key analogies from the experience. The climb is the journey, but along the way some parts of path can clearly been seen into the distance and you can gauge their difficulty, but as I got higher the clouds came in and I could barely see 10 meters in front of me. I did not know what the terrain looked like. The most uncertain parts came near the top, where the path was no longer evident and it was marked by large piles of stones every so often. When trying to reach the pile directly in front of me I would be scanning for the next pile. The clouds were so thick that I was not able to see it. I needed to see it so I can position myself on the correct path before I reach the stones in front of me. It help reduce the number of steps I took but it rarely happened that I would see the next pile until I reached the pile right in my path. Often times I would reach the pile and have to scan the horizon, and sometimes I did not see the anything. I would have to wait a few seconds for the clouds to pass and then I would see a silhouette that resembled a rock pile. This made me think of this journey I’m on with my family. I so desperately want to know what is next but nothing is being revealed long term. I just get little bits as I go and many times I can’t see what’s next. I have to be still and listen (something I’m not good at). A couple times i would panic and think I’m lost on the mountain only to have the rock pile reveal itself through the cloud, and I would press on. That rings so true in my life’s journey. My trust in God is weak when tested. Snow had covered most of the mountain top and I desperately tried to stay on the rock path to avoid the deep snow, but sometimes this was not possible. I had to cross the snow. I would see the places where hikers before me sunk in 3 or 4 feet into the snow. I was hoping I wouldn’t because it took all I had in me to get my leg out. It took my strength from me, and once I did get out of the hole, often my other leg would disappear into the snow. It made me think about those times when I sink emotionally. It’s so draining you want to give up and go back to what you know, but that has no benefit at this time. And so often you pull out of one hole only to fall into the next. You want to give up. Your start to be convince you that this is too hard or just not worth it. Why did you leave in the first place? But you keep moving, you keep hoping you’ll learn something and be better for it, even though you have really no clue how long this journey will last or what I will get from it. Even though I hope its a big revelation in the end, the fact is, it may be a very simple relationship building exercise to know my Jesus better. I can’t think of a better will He has for me. What that will look like? I don’t know. I have to wait for the clouds to clear. 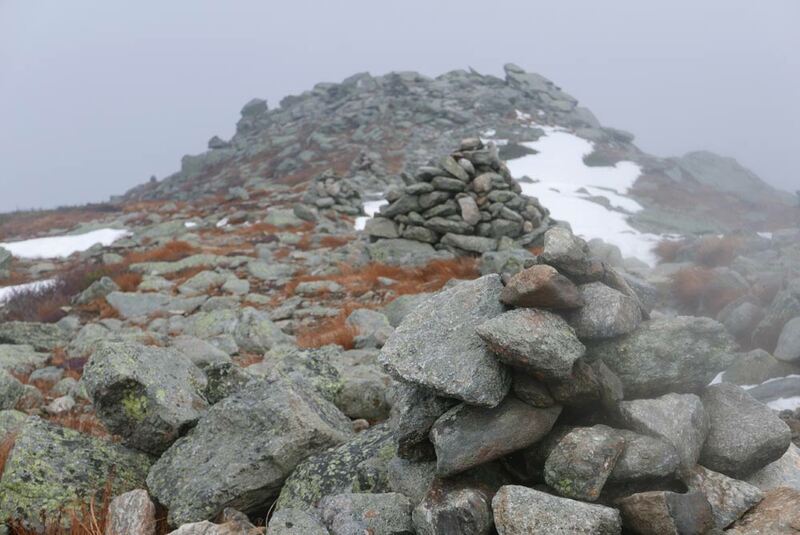 Rock pile path markers on mount Washington.